A balls-out postmodern comedy par excellence. It's a Royale with Cheese. 149 min. Miramax. Director: Quentin Tarantino. Cast: John Travolta, Samuel L. Jackson, Uma Thurman, Harvey Keitel, Tim Roth. Perhaps the most common critical response to writer-director Quentin Tarantino's sophomore feature Pulp Fiction is that it's "ridiculously entertaining." And there's little sense in arguing that point, at least to an audience of movie-lovers unopposed to outrageous R-rated plot twists and self-consciously sick humor. For that very large contingent, Pulp Fiction is a masterpiece, the masterpiece of the late twentieth century, a hugely influential, irony-laden work of pop art that's colorful in its characters, language, and imagery. On the other hand, those weaned on "The Emperor's New Clothes" will have a hard time banishing the nagging feeling that Pulp Fiction addresses reality only in superficial and juvenile terms: for Tarantino, reality is immersion into the world of movies, making him the ultimate narrative spokesman for generations who experience the world through screens. Tarantino's fast and funny narrative has been rightly celebrated for its gift of gab and precision of plotting. The film explores the Los Angeles of our strangest dreams, with a large cast of characters linked through crime. Vincent Vega (John Travolta) and Jules Winnfield (Samuel L. Jackson), chatty henchmen of gangster Marsellus Wallace (Ving Rhames), endeavor to collect a mysterious briefcase and return it to their boss. Vincent soon finds himself in the unenviable position of watching over Marsellus' flirtateous and trouble-prone wife Mia (Uma Thurman). Meanwhile, low-rent boxer Butch Coolidge (Bruce Willis) comes to an unexpected detente with Marsellus, recently enraged by Butch's failure to take a scheduled dive. Lastly, Vincent and Jules rely upon "cleaner" Winston Wolf (Harvey Keitel) to resolve a sticky situation. Being in Pulp Fiction provided a boost to each actor's career—none more so than Travolta's—and the eccentric ensemble contributes to the movie's "cool" factor: among the others who appear are Tim Roth, Amanda Plummer, Christopher Walken, Roseanna Arquette, Maria de Medeiros and Eric Stoltz. Chockablock with memorable moments and film-geek references, Pulp Fiction flies by, despite its 154-minute run time. Tarantino brings out the theatrical best from his cast, who deliver iconic performances for what's become an iconic movie: take Walken, whose instant-classic monologue by Tarantino brilliantly meshes with the actor's quirky-crazy style. The scene is emblematic of the movie as a whole in the way it skillfully builds tension, then releases it with an undercutting punchline, in this case verbal, though often, elsewhere, visual: rinse with blood and repeat. Willis is hilarious, Jackson has never burned brighter, and Travolta salvages a career in turnaround (to a soundtrack of likewise rescued pop songs from Tarantino's offbeat vinyl collection). 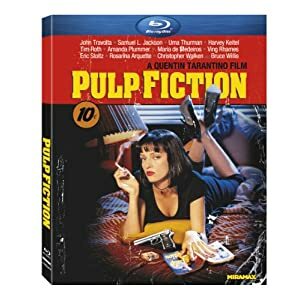 One could read from Pulp Fiction a treatise on the random vagaries of life or even a playful endorsement of mystical belief systems, in their capacity to scare people straight, but let's face it: Tarantino's film makes most sense as a balls-out postmodern comedy par excellence. It's a Royale with Cheese. Lionsgate does up Pulp Fiction for the hi-def era with a Blu-ray special edition that wipes the floor with all previous editions. The film looks and sounds fantastic, in a transfer billed as personally supervised by Tarantino. So it's no surprise that the image retains its filmic character and accurately renders color and contrast, to a "T." Strong black level contributes to the general solidity of the image, which yields far more detail than standard def has ever been able to muster for this title, and those colors appear bold and beautiful. And the lossless DTS-HD Master Audio 5.1 mix is a treasure, pumping up the pop music, pounding out the sound effects, and never losing sound of the bristling dialogue. 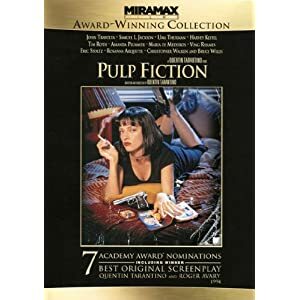 Pulp Fiction rates a brand-new retrospective called "Not the Usual Mindless Boring Getting to Know You Chit Chat" (43:01, HD), which revisits cast and crew for their retroactive perspectives on the film (see how that works?). "Here are Some Facts on the Fiction" (20:37, HD) is a great idea for a bonus feature on a seminal film: a critics roundtable, in this case gathering Elvis Mitchell, Scott Foundas, Stephanie Zacharek, Tim Lucas and Andy Klein. They get to speak their piece, even when it includes suggesting the film's weaknesses. "Pulp Fiction: The Facts - Documentary" (30:31, SD) includes vintage interviews on the making of the film. "Deleted Scenes" (24:39, SD) come with an introduction by Tarantino. Behind the Scenes Montages include "Jack Rabbit Slim's" (4:44, SD) and "Butch Hits Marsellus" (6:02, SD). "Production Design Featurette" (6:22, SD) focuses in on production designer David Wasco and set decorator Sandy Reynolds-Wasco. Included is the complete "Charlie Rose Show" (55:27, SD) with Tarantino, and "Siskel & Ebert At the Movies: The Tarantino Generation" (16:00, SD) is another cool vintage inclusion, from America's favorite movie reviewers. "Independent Spirit Awards" (11:29, SD) finds Michael Moore chatting up Tarantino, and we get the latter's "Cannes Film Festival - Palme D'Or Acceptance Speech" (5:20, SD). A thorough Marketing Gallery serves up "U.S. Theatrical Trailer" (2:35, SD), "UK Theatrical Trailer" (1:04, SD), "French Theatrical Trailer" (2:32, SD), "German Theatrical Trailer" (2:34, SD), "Japanese Theatrical Trailer" (2:17, SD), "Question TV Spot" (:15, SD), "Electrifying TV Spot" (:16, SD), "Event TV Spot" (:16, SD), "Reaction TV Spot" (:16, SD), "Nominations TV Spot" (:15, SD), "John TV Spot" (:16, SD), "Question/Review TV Spot" (:31, SD), "Review TV Spot" (:31, SD), "On the Move TV Spot" (:31, SD), "Movie Event TV Spot" (:31, SD), "React/Review TV Spot" (:31, SD), "Academy 7 TV Spot" (:31, SD), and "Travolta Academy TV Spot" (:31, SD). Posters, Academy Award Campaign and Trade Ads, and a Still Gallery round out the disc. All site content © 2000-2019 Peter Canavese. Page generated at 04/25/2019 04:45:42PM.